Do you or your family like to camp and commune with nature? Mine sure does. We spend a lot of time in the warmer months camping and doing all kinds of outdoor activities. As always I look for awesome products to share with all of you, my readers, that make life a little easier or better. This 10 pc Camping Cookware + Camping Stove falls into both categories. I really like this set. It comes with a carrying bag to make packing and carrying it easy. Included in this set is a small pot with a lid, a small frying pan, both have folding handles so they take up less space when being carried, and they are both non-stick pans for easy cleaning. 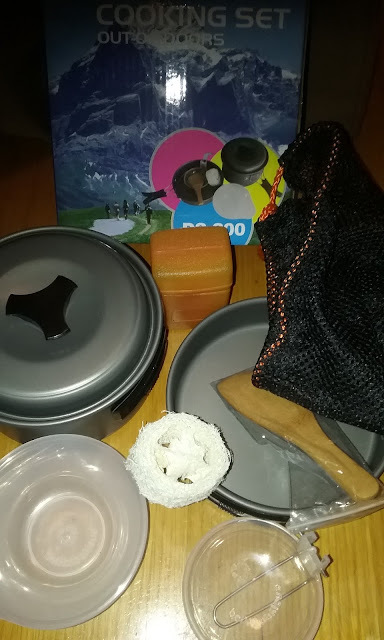 Also included is a wooden spoon/spatula, a loofah for cleaning, the camping stove that connects to a small propane tank,a small bowl and a folding ladle.Plus the mesh carrying bag that the whole set fits into. 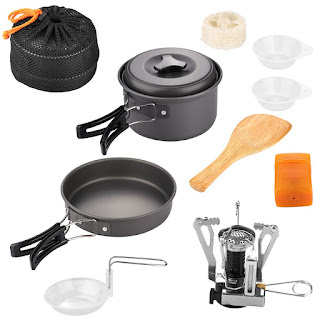 This set is perfect for camping,backpacking, hiking, or as part of your survival kit. I think this would make a nice gift for any of your outdoorsy friends or family.